I admire the many faith-based organizations in this country that provide services to those who are homeless or hungry or substance abusers or unwed moms or domestic violence victims or ex-convicts or others who need loving-kindness. Jack Wilson is such a missionary. Six years ago, he left his relatively comfortable life here in the United States to bring lost souls to salvation in Payatas, a God-forsaken wasteland on the outskirts of the Philippines capital of Manila. A PBS documentary attested that “entering Payatas is like spiraling into Dante’s Inferno.” Indeed, it is little more than a gigantic garbage dump. And many of its poor residents, including children, actually live in the stinking refuse. 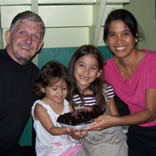 It is in that hell on earth that Pastor Jack and his wife Malou established their mission. It is where they serve thousands of the most needful people on earth, with a feeding program, medical mission, camp for kids and regular distribution of clothes and toys. At the same time that Pastor Jack and his missionary team attend to the physical needs of the people of Payatas, they also minister to their flock’s spiritual needs with evangelistic programs, including Christian-oriented movies and live performances, and the preaching of the Gospel. What I find most extraordinary about Pastor Jack’s Payatas Mission Outreach is that it operates on a shoestring. It serves a multitude with the most meager of resources. As to the pastor’s own needs, he has no home gifted to him and his family, like many pastors here in the states. He had no vehicle until recently, when he bought a 21-year-old junker (that has repeatedly broken down on him). He has no medical coverage. No paid vacation. But he does have the joy of the Lord. And it is his strength. Pastor Jack’s desire is not to live the exceedingly abundant life enjoyed by more than a few well-heeled pastors all of us know of. No, every dollar, every Filipino peso his mission raises is committed to Kingdom-building purposes in Payatas, including construction of a proper church building, which can accommodate the growing number of souls the mission has brought to Christ, as well as a school and medical clinic. Missionaries, like Pastor Jack, are doing the Lord’s work in places, like Payatas, where most of us would dare not tread. I do not feel God’s call to follow in their footsteps. But, as a Christ follower, I do feel His call to support them with my purse. 29 Jul	This entry was published on July 29, 2012 at 11:53 AM. It’s filed under Church and tagged CHURCH PLANTING, GREAT COMMISSION, MISSIONARIES, PASTOR JACK WILSON, PHILIPPINES, religion. Bookmark the permalink. Follow any comments here with the RSS feed for this post.